My family’s favorite way to celebrate a birthday is with a Bundt cake. My mom loves lemon cake—moist and dense—with a light lemon glaze. My daughter always asks for a rich root beer Bundt cake with a sweet and creamy maple frosting for her special day. Birthday Bundt cakes are beautiful, but I refuse to let a Bundt pan sit alone in the dark until the next birthday celebration comes along. That pan works hard in my kitchen. Since moving from a big house to a tiny apartment, I have whittled my kitchen accessories down to the bare minimum. That said, my two (Yes, I have two. One is heart shaped!) Bundt pans made the cut. This first recipe is one of my favorite “one pot” meals. Roasting a chicken in a Bundt pan is such a genius idea, I wish I had thought of it myself. 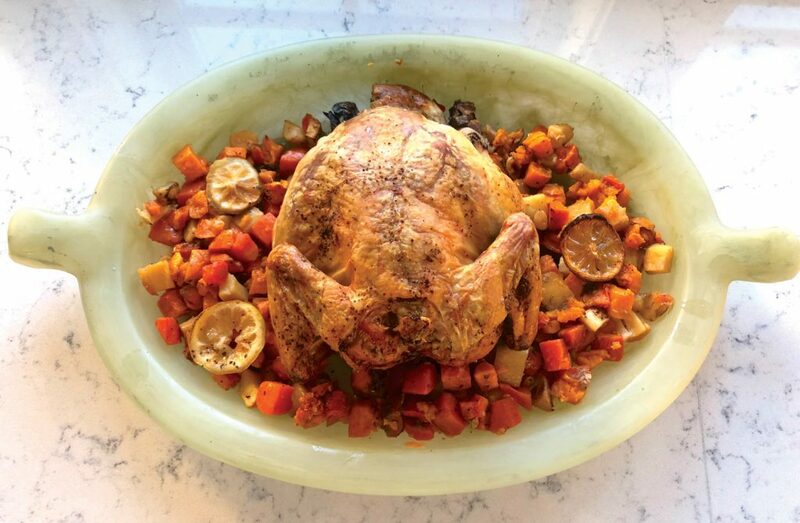 It’s the perfect way to cook a medium-sized bird (3–4 pounds). If you’re cooking for a crowd, you can easily fit two Bundt pan chickens into your oven at a time. That way there are more drumsticks for everyone! Here’s my recipe for what has become a go-to Sunday supper in my house. And if you want to serve bread with your bird—or any other meal—try this savory monkey bread recipe. Some people call it “pull-apart bread,” but no matter what you call it, it’s delicious and so much fun. 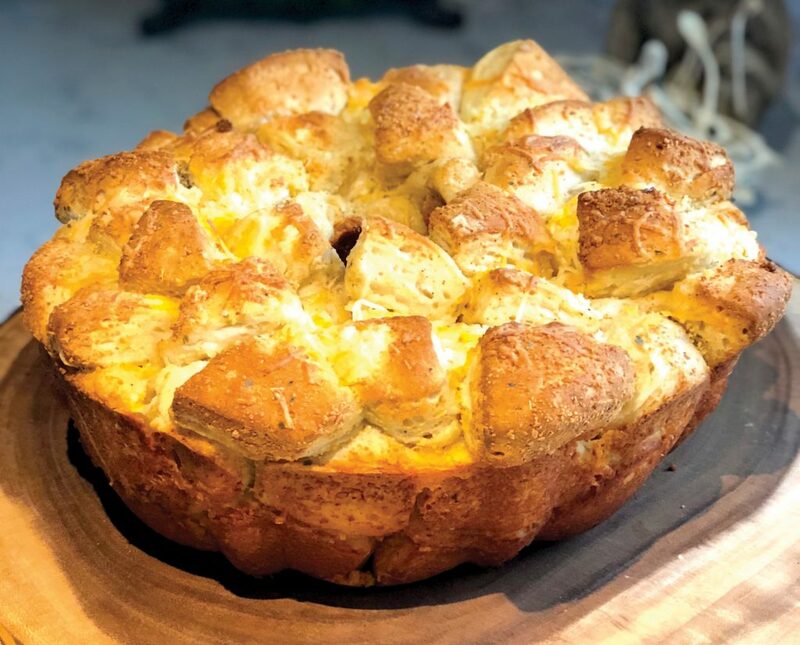 My garlic and cheddar monkey bread is a tasty accompaniment to pasta, stews or chili. Or warm up a cup of marinara sauce and serve it as an appetizer. Let your guests pull and dip to their hearts’ content! Preheat oven to 425°. Place rack low enough to accommodate Bundt pan with chicken. Rinse chicken and pat dry, let stand to come to room temperature. Tuck 4 garlic cloves under the skin on the breast and thighs. Cover Bundt pan hole with aluminum foil and butter the sides and the bottom of the pan. Crush the remaining 2 cloves of garlic and put them in the olive oil. Toss the root veggies in the garlic and oil and put them in the pan, and salt and pepper to taste. Place lemon rounds on top of the veggies. Pour wine over the vegetables. Rub salt and pepper into the skin of the chicken and place the chicken cavity on the foil covered Bundt pan tube so the chicken is sitting upright on the veggies. Remove from oven and transfer chicken to a platter to carve. Use slotted spoon to transfer veggies to serving bowl, removing lemon rounds. Strain the remaining liquid into a small saucepan and heat. When carved chicken is ready to serve, drizzle cooking liquid on chicken and serve with the veggies. Grease 10-inch Bundt pan with cooking oil. In large plastic bag, mix grated Parmesan, cayenne, and oregano. Cut each biscuit into quarters. Put biscuit pieces in Parmesan mixture and shake well. Alternate layers of cheese-dusted biscuit pieces and shredded cheese in pan. Mix melted butter and garlic with whisk, then drizzle over the biscuit and cheese layers in the pan. Bake 35 minutes or until golden brown. Let stand for 10–15 minutes, then place a serving plate over the top and turn the Bundt pan over to remove the monkey bread. Serve immediately. Use your Bundt pan to cut corn off the cob. Put the tip end into the hole in the tube and slice away. The kernels will fall neatly into the pan. For a fun and festive punch, freeze water halfway up the pan. Once frozen, layer cranberries, sprigs of rosemary or thyme, or edible flowers and fill the bundt pan to the top with more water. Once all frozen you’ll have a lovely and practical way to cool your celebratory punch bowl. For your next lunch or brunch party, make a chicken or tuna salad, then pack it into a greased Bundt pan, level the top and chill. When you’re ready to serve, unmold the salad upside down onto a pretty platter and garnish with fresh herbs. Candace Karu makes her living writing about food, fitness and travel. Follow her on Instagram: @candacekaru or at candacekaru.com.